Born to Run: Vermont Sled Dogs Delight, Compete and Educate | Features | Kids VT - small people, big ideas! One sure way to get kids excited about learning? Make the lesson about dogs. It works for Adrienne Magida. 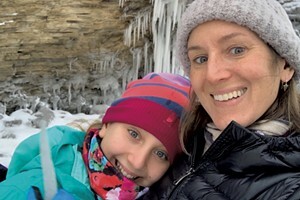 In mid-February, her first and second graders at Waterbury's Thatcher Brook Primary School will begin a three-week unit that revolves around the Iditarod Trail Sled Dog Race, Alaska's famous 1,000-mile dogsled race from Anchorage to Nome, which starts March 2. Magida uses the annual race to teach reading, writing, history, geography and even technology, thanks to the race's detailed website, which includes resources for teachers and students. Once the Iditarod begins, the site enables kids to follow its progress. "There's just so much interesting stuff about the race that is so kid-friendly," Magida says. "Dogs and winter and sleds? I mean, how can you go wrong?" Especially in Vermont, where kids have the opportunity to meet real, live sled dogs. As Magida's students will learn, the Iditarod replicates the 1925 emergency dogsled relay that brought diphtheria medicine to Nome, a coastal town on the Bering Sea closer to Siberia than to Fairbanks. In the midst of winter, in those days, radio telegraph was the icebound town's most reliable means of communication. On Jan. 20, 1925, a radio signal went out: "Nome calling ... Nome calling ... We have an outbreak of diphtheria ... No serum ... Urgently need help ... Nome calling..."
Seattle heard and replied, "Fresh serum available here ... Airplane standing by... " But the airplanes at that time had open cockpits. Heavy snow and bitterly cold temperatures made flying unsafe. So serum was sent by train from Anchorage to Nenana, the closest that trains could get to Nome. By the time the serum got to Nenana, on Jan. 27, three children had died of diphtheria, more cases were being diagnosed, and Nome was still more than 650 miles away. That's when musher "Wild Bill" Shannon lashed the serum to his dogsled, and the relay began. Through whiteouts, 4-foot snowdrifts, gale-force winds and temperatures that dipped to 50 degrees below zero, mushers and their dog teams passed the medicine down the Iditarod Trail, a path the government maintained for dog teams to deliver mail. After his two lead dogs froze to death, Charlie Evans harnessed himself to his sled. Gunnar Kaasen dug through snow with his bare hands to find the serum after it was lost when a blast of wind lifted his dogs and sled into the air. It normally took a musher 15 to 20 days to get to Nome. But the relay's 20 mushers and roughly 150 dogs covered the 674 miles in five days and seven and a half hours. And on Feb. 2, a dog named Balto led Kaasen's team into Nome. Balto has been immortalized in a 1995 animated movie and is depicted by a statue in New York's Central Park. The actual dog is mounted and displayed at the Cleveland Museum of Natural History. In Magida's classroom, first graders will read picture books about Balto and second graders will choose chapter books. 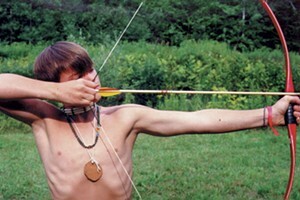 As they study the modern-day Iditarod race, they will make oaktag sleds with popsicle-stick runners. Magida will give them flannel to put inside their sleds, felt to make booties like the dogs wear and clay to make something racers would need, such as an ax or dog food. They will write a report on the Iditarod, and they will pick a few mushers and follow them from checkpoint to checkpoint, over the Alaska Range, up the Yukon River, along Norton Sound, and into Nome. A highlight in the unit comes when Hinesburg musher Rob Farley brings his sled and a few of his dogs to school, and all Thatcher Brook first and second graders — about 145 total — meet in the gym. Farley teaches them that the most common three breeds of purebred huskies are Alaskan malamute, Samoyed and Siberian. That other breeds — Irish setters, border collies and even standard poodles — also pull sleds. And that some dogs pull people on skis — a sport called skijoring — and on bikes, scooters and skateboards. Then, the kids get to go outside to meet Farley's dogs and harness themselves to the sled to pull each other around. 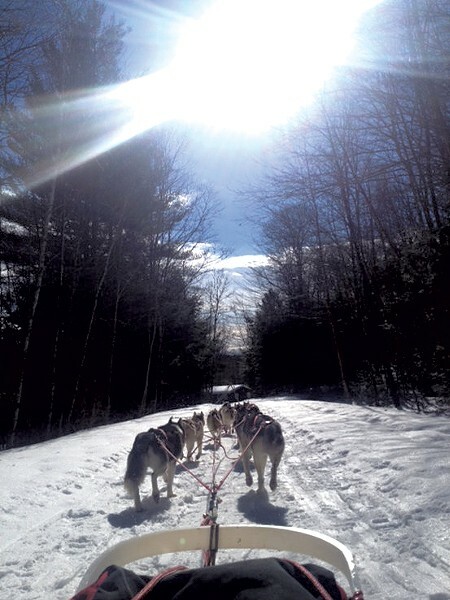 Farley owns October Siberians, a touring company that offers rides in Waterbury's Little River State Park and at Stoweflake Mountain Resort & Spa. 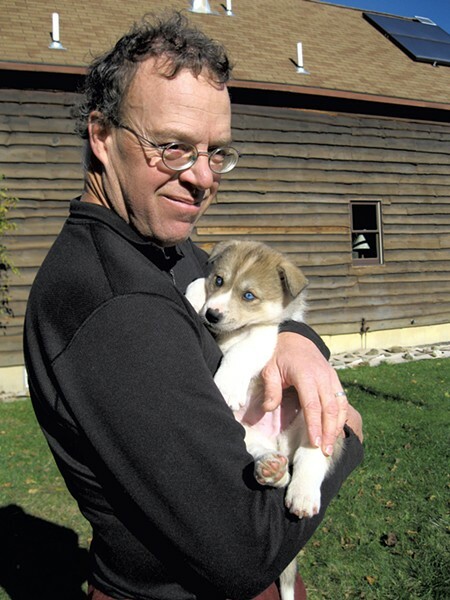 He estimates that there are 100 sled dog kennels in Vermont, with five or six of them giving tours. Many other kennels are recreational, with five or six dogs. Farley has 21 purebred Siberian huskies, a relatively small working kennel, he says. Whenever he runs a tour, speaks at schools or appears at other events, he uses the opportunity to teach. "I just want people to understand the relationship of working dogs and the people that own these working dogs," he says, "and that they're really doing what the dog was meant to do, what it likes to do, and that it's not a forced thing. It's an enjoyable activity for us both." Students from Champlain Valley Union High School and the University of Vermont's animal science program have interned with Farley. He teaches students to care for the dogs, to understand their personalities and to run a dogsled. "You're planting seeds, and you're sparking kids' interest," he says. Some of the UVM students will become vets, he says. "And I really want vets to understand what we face when we have a kennel of dogs and that our decisions are made based on the pack, not the individual love and devotion of a single dog." Having extra hands around is a bonus, too. It takes an hour to feed the dogs and to clean their 6-by-12-foot kennels. Dogs are divided into groups for supervised play time in a fenced yard. And they run three or four times a week — three to four miles as they start getting in shape in the fall and 25 to 30 when the tour season is in full swing. Logan Griswold, a UVM freshman from Williston, interned with Farley last year for his Grad Challenge, a project required of all CVU seniors. A lover of dogs and winter, Griswold had written an essay about four-time Iditarod winner Susan Butcher, which piqued his interest in sled dogs. One of the lasting lessons he learned working with Farley was resiliency. "One of the important rules of dogsledding is not to let go of the sled and let them get away," Griswold says. But one time, when Griswold was driving, the team took a sharp left that he had not commanded. He fell off and let go. But his next time out, he says, "Rob gave me a team to drive on my own. And I made it through the entire day without falling off." Farley, who occasionally takes a wild ride himself, maintains an even disposition. When he talks, he sounds measured, patient and a little amused, a cross between Mister Rogers and Jerry Seinfeld. "I got dragged on my knees through most of this," he says, after driving his sled around a bend on the Notch Road in Stowe in January. "But we stayed upright!" After 25 years working with Siberians — breeding, raising and training them — he appreciates the breed. "I found that they're very nice, friendly dogs," he says. They're independent and smart, he says. "But not necessarily obedient ... You can see the lights on." Lack of snow in Waterbury forced his tours this day to the portion of Vermont 108 — the Notch Road — that is closed to cars during the winter. The scene is postcard-perfect. Snow-dusted trees and marshmallow-cream hills sparkle under blue skies. Alan Joy of New Hyde Park, N.Y., is about to get a ride, a present for his 30th birthday from his wife, Lisa, who will ride, too. Farley's daughter, 19-year-old Sage Coates-Farley, a freshman at American University, is helping out during her semester break. Her first word was "doggie," and she wrote her college application essay about growing up with sled dogs. She has photos of all 21 current dogs displayed in her dorm room. "I've got family pictures, too," she adds. The blue and brown-eyed huskies lounging around the GMC pickup with the orange "dog box" topper at the base of the closed road spark curiosity, and father and daughter are happy to answer questions. Many people are surprised by how small the dogs are — males average 50 pounds, females, 40. They start training when they're 6 months old, and they all can pull double their weight. They eat a working dogs' diet that contains 35 percent protein and 25 percent fat, and Farley buys food by the ton. His dogs eat 4,000 pounds of specialty kibble and 2,000 pounds of meat — poultry scraps from Vermont's Misty Knoll Farms — each year. They are expected to wait while food is placed in front of them until they are given the OK, an exercise to keep the dogs well-mannered and to remind them who is in charge. A cluster of onlookers has gathered by the time Alan Joy's birthday tour is about to start. Ten dogs are harnessed to the gang line in front of the sled. Alan stands on the runners behind Farley, and Lisa, wrapped like a burrito, is tucked into the sled basket in front. "OK, guys, let's go," Farley tells the team. And the sled glides quietly up the road. Farley used to race around New England and in Québec. 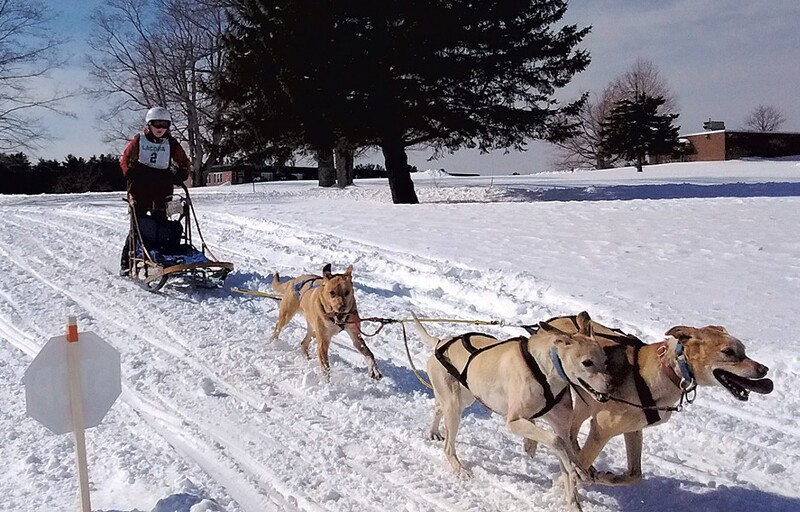 Forty years ago, there were races in New England every weekend, says retired Wolcott musher Mike Green. "Now, it's kind of died off. It's expensive to maintain a big dog team, so we don't have that many races anymore." Lack of snow also forced cancellations, Green says. "I think the biggest thing that affected us was global warming." Vermont had races in Newport, East Burke, Shelburne, Stowe, and Lake Elmore, Green says. Now there is just one — which Green organizes — on the Lamoille Valley Rail Trail, starting and ending in Morrisville. It's scheduled for Feb. 9 and 10. 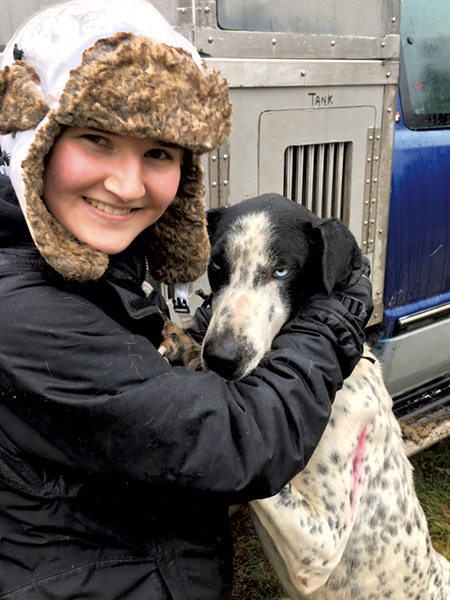 Sixteen-year-old Kayleigh DiMaggio, of Hooksett, N.H., plans to enter the six-dog class, where she'll race against adults. Classes with three or fewer dogs are for kids only, Kayleigh says. She's been training with dogs since she was 5 or 6 years old. "I just really like dogs," she says. "I've always really liked dogs. And there's also the adrenaline; I like going fast. I like going around turns and trying to keep the sled upright. It's just exciting." Her dad and his brother both started racing when they were 5 years old. They quit as teenagers, and then her grandfather picked it back up. "And when I was a kid, and I found out there was a sport involving my favorite animal," Kayleigh says, "that was like the craziest thing in the world to me." 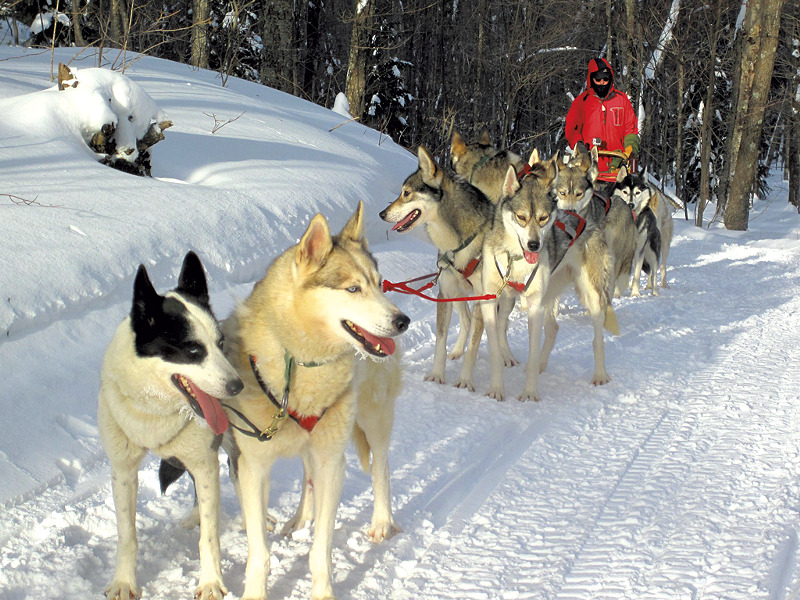 The first dogsleds date back to 1000 A.D. and were developed by the Inuit people as a means of transportation. Sled dogs are well-equipped for the cold, with a thick "double coat" consisting of a coarse outer fur and a dense, softer inner layer for insulation. Paws are protected by thick pads, and a fluffy tail allows for a nose cover while the dog is curled up in a ball when sleeping out in the elements. The breeds most often used in dogsledding teams are Siberian huskies and Alaskan malamutes. They are highly intelligent and easily trained. While domestic dogs of a similar size typically only require around 1,700 calories a day, sled dogs can easily consume up to 10,000. During very cold weather, a mixture of hot water, proteins and kibble are cooked together to make a warming stew. Sled dogs can and do change roles on the team depending upon dynamics, terrain or musher strategy. "Lead dogs" may not be the fastest dogs, but they must be the most intuitive to catch subtle signals from the musher and direct the team behind them. Directly behind the lead dog are two "swing dogs" that help navigate turns, especially helpful in deep snow or on steep trails. The middle dogs are "team dogs," acting as the crucial power to the entire team. Finally, the strongest dogs are placed in the very back, closest to the musher, and are called "wheel dogs."